This recipe will have you looking for excuses to celebrate – make a delicious batch to help celebrate the New Year or any time at all! 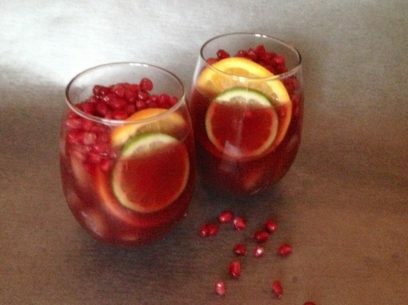 Here’s a good tip: get a large bottle of pomegranate juice – I use POM wonderful – when available. This way you have plenty for the sangria and for the pom molasses too. I get a large bottle for just under $10 here in Boston, much less expensive than buying the equivalent in small bottles.